Toby Cumberbatch was educated at The University of Manchester Institute of Science and Technology, in Manchester, England. His first job was with GEC Telecommunications in Coventry developing software-controlled telephone exchanges. After gaining his doctorate he started work on the development of novel coating methods for II-VI thin film solar cells at the Thorn-EMI Central Research Laboratories in 1980. He extended this work at the University of Cambridge and then moved to the Interdisciplinary Research Center in Superconductivity to work on the deposition of superconducting oxide films. Dr. Cumberbatch emigrated to the USA in 1991 to join Quadic Systems Inc., a small integrated circuit design company in Southern Maine. He joined the faculty of the Electrical Engineering Department at The Cooper Union in 1994 where he established the Electronic Materials Laboratory in 1999. In 2001, he was appointed a Visiting Professor at The Kwame Nkrumah University of Science and Technology in Kumasi, Ghana and returns regularly to East and West Africa. To bring together students from the three schools to develop sustainable solutions to the problems facing humankind, Dr. Cumberbatch founded the Center for Sustainable Engineering, Art and Architecture – Materials, Manufacturing and Minimalism (SEA2M3) in 2005. With grants from the National Science Foundation, the Environmental Protection Agency, the National Collegiate Inventors and Innovators Alliance, and generous donations from private benefactors and small companies, students from all three schools in the Cooper Union continue to work on a range of projects that address energy, water and shelter in remote, rural regions in the less industrialized world. 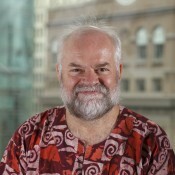 Dr. Cumberbatch has strong links with universities and communities in Ghana, Rwanda, Kenya and Burundi, is a Visiting Professor at the National University of Rwanda, an external examiner at The Kwame Nkrumah University of Science and Technology, a member of several international conference advisory panels and lectures regularly on Sustainable Design and Development.